Home Technology Can we produce energy in dark? Can we produce energy in dark? Solar energy innovation is the next big thing in the field of natural science. The promising field seems to have inspired researchers at Harvard and MIT University, who have introduced specific molecules that can store the energy for later use. The photo switching substance that is assumed to have the capability of energy generation was Azobenzene. This material was conjugated with carbon nanotubes. The phenomenon: The simple photo-switch molecule possesses specific configuration, but when hit by the ultraviolet light, it changes its configuration. There is a reversible alteration in the molecule of Azobenzene that liberates heat energy. The challenge: Packing the right number of molecules together to generate sufficient energy for good heat. Researchers were unsuccessful in packing up enough molecules. They packed fewer than half molecules that were needed as depicted by computer simulation for the experimental process. The experiment showed much-needed concern for packing up nanotubes nearer together than aggregating Azobenzene together with nanotubes. Azobenzene and nanotubes interlock with each other and produce larger energy yield. Combination of photo-switching substance with various substrates will also be prolific and help in achieving parallel results or may be far better outcomes. So how this technological innovation would work on the profitable scale? Lead researcher at MIT and Harvard voiced in The Atlantic that the storage would be in the form of a liquid which is an easy way for transference. This will enable charging by flowing the material from one tank to another through a tube or an opening while keeping this in sunlight until it is needed and at the time of movement of the liquid back to the tank, there would be an exothermic process that will release heat energy to the surface. The apparition: This technology is a great alternative for the people who derive heat energy through wood burning and inject the harmful gases in the atmospheric layers that leads to disruption of atmosphere and hence risks the sustainability of the environment; it can potentially be a revolution in solar energy technology. It would be more fruitful if it runs at a commercial level. Photo switching can be upgraded to systems that will run on an industrial scale and store the reservoir of heat energy. This heat energy could be utilized for many purposes regardless of day and night. 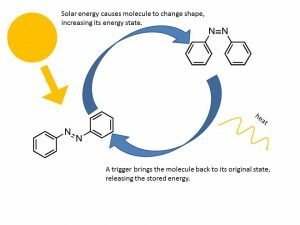 Every time Azobenzene shifts from one structural form to another form it absorbs the amount of energy, and this energy stored in the form of heat energy that can be seen through observation of molecular optical properties. The comparison of solar power panel with standard UPS battery shows that the average ups battery takes around 4 hours to charge fully and it gives the stand time of 2-3 hours. While the solar panel gives the backup time of up to 13 hours and it also comes with change-over switch in case if the battery goes out of charge. The lifespan of the standard UPS battery is 3-4 years, and that of a solar panel is more than 25 years. Comparison with the energy generation from wind power, one wind turbine generates energy equivalent to 48,704 groups of solar energy. But the downside of windmills is that they cannot operate in congested or crowded areas. The cost of the solar energy installation entirely depends on the solar panel systems and inverters. One survey suggests that the cost of the solar panel is declining because of the low price in the investors. Moreover, the installation will be equivalent to the regular electricity cost. The benefit of solar power energy generation is preferable because it comes with the organic or most natural way of production of energy without any damage to the sustainability of environment as compared to the electricity generation from power fuels. Furthermore, the photo-switching material is easily available and can be processed organically in the laboratory. Thanks to science for providing a most accessible way of generating heat energy!